Last weekend members of The Travel Visa Company team took part in our first ever charity run. And what a run it was! 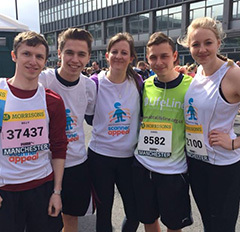 We ran the Morrisons’ Great Manchester Run, the biggest 10K in Europe with 40,000+ runners, which made up part of a weekend of sporting events in the city. It was a scenic run, starting and finishing in the city centre and passing Old Trafford along the way. The streets were lined with bus loads (quite literally!) of supporters, there were live bands and DJ’s playing at various points of the course and a mass of runners with incredible stories of charity and fundraising. The Mid Cheshire Hospitals Charity appeal was set up to fund £1million for a new MRI scanner. The existing scanner operates 8am – 8pm 7 days per week. A new scanner would allow more people to get treated and shorter wait times, keeping up with the growth in population. The Travel Visa Company ran for two very worthwhile causes; Mid Cheshire Charitable Funds and ABTA LifeLine. In total six members of staff took part. 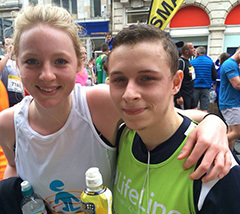 Dan and Phil were running for ABTA lifeline and Vicky, Duncan, Billy and Lisa were running to raise money for Mid Cheshire Charitable Funds Scanner Appeal. ABTA LifeLine is ABTA’s charitable trust. Our mission is to help travel industry colleagues when they or their families need help. We award grants to help ease serious financial hardship caused by life changing medical conditions, bereavement, disability and domestic violence among other things. With a very varied range in age and ability, we were put in different starting groups and set ourselves individual training schedules and goals (all of which were beaten!) Other members of the team came to support the runners, and we’re happy to say that everyone completed the 10K with the following finishing times – well done! Phil and Dan raised a whopping £480.00 in total for ABTA LifeLine. Vicky, Duncan, Billy and Lisa raised £335.00 for Mid Cheshire Charitable Funds. Thanks to everyone who supported and sponsored us – it really helped keep spirits up.